Set of three parametric helix spinning tops, 3D printed from one continuous line of filament. 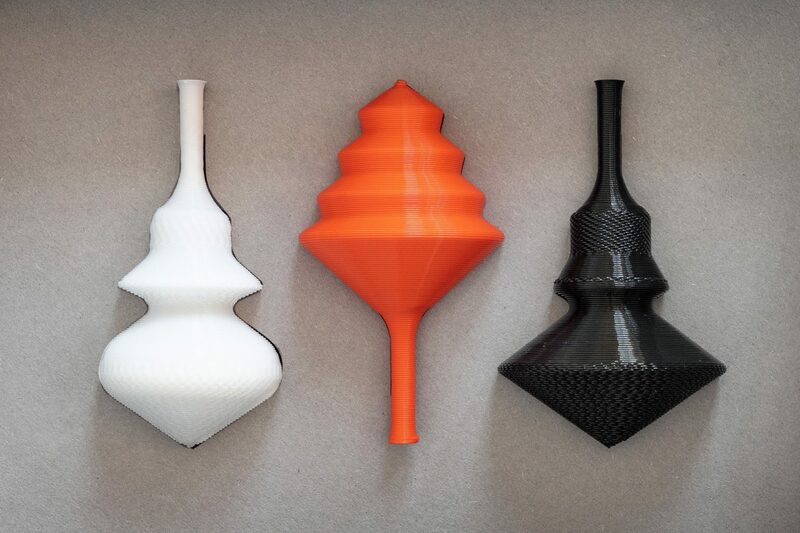 A family of 3D printed parametric helix spinning tops, made from one continuous PLA filament. The latest technology gave birth to an innovative reincarnation of this ancient toy, perfect for both design enthusiasts and high-tech collectors to enjoy. Each set consists of a unique combination of tops picked from the helix tops family. All have a height of 70 mm and vary in their diameter and contouring. The varied sinus-wave textures on the surface of the tops enabled the addition of material in certain areas of the top, increasing weight in order to optimize spinning. Functional decoration. Each edition is one-of-a-kind and available for a limited duration only – as we only produce our products on demand, we can stay fresh and flexible with the range we offer. We frequently add and remove color & material combinations according to changing inspiration, taken from our daily work designing at studio 7.5. In former times, a craftsman treasured his own tools, as they were indispensable for demonstrating his mastery – nowadays, in a digital age where manual skills have taken a backseat, the 3D printer is our go-to tool for crafting objects. Crafting an object means controlling every step in its materialization – this is why we developed our own algorithm to exactly define the path for the printer to follow. We are merging the process of designing an object with the process of its materialization: designing and manufacturing are no longer two discrete entities, instead they merge into one, holistic, creative process. The beautiful, fine fluted texture derives from our distinct print resolution – we celebrate this new manufacturing technique instead of attempting to mimic traditional plastic manufacturing processes. Created from one continuous line of filament, with no need for extra finishing processes or additional materials, the Helix collection is the most economical and minimalist design solution to create 3D printed objects. Our products are 3D printed in Berlin on 3D printers made in Berlin, with PLA filament made in Berlin. It can’t get more local than that! Since our production chain is so local and we can start printing at the touch of a button, we not only fulfill orders relatively quickly – we only produce our products on demand. With no need to store stock, we can stay fresh and flexible, launching new products whenever inspiration strikes.